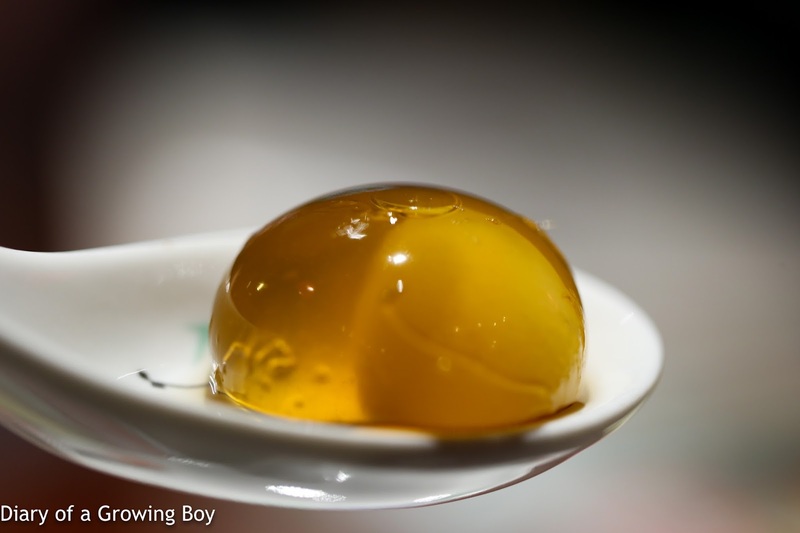 Sweet rice dumplings (破漿重圓) from Lee Lo Mei (李好味), Hong Kong - yes, spherification is still being done, but this one was really nice. I loved this modern take on the classic Chinese dessert, as the flavors of the ginger syrup hits one's tongue after the sphere bursts. Barbecue pluma Iberico pork, Yellow Mountain honey (蜜汁頂級西班牙黑毛豬叉燒) from Mott 32 (三二公館), Hong Kong - after hearing about the hype surrounding this signature dish, I finally had the opportunity to taste it for myself. And it WAS damn good. It stands apart from many, many good versions available around town. 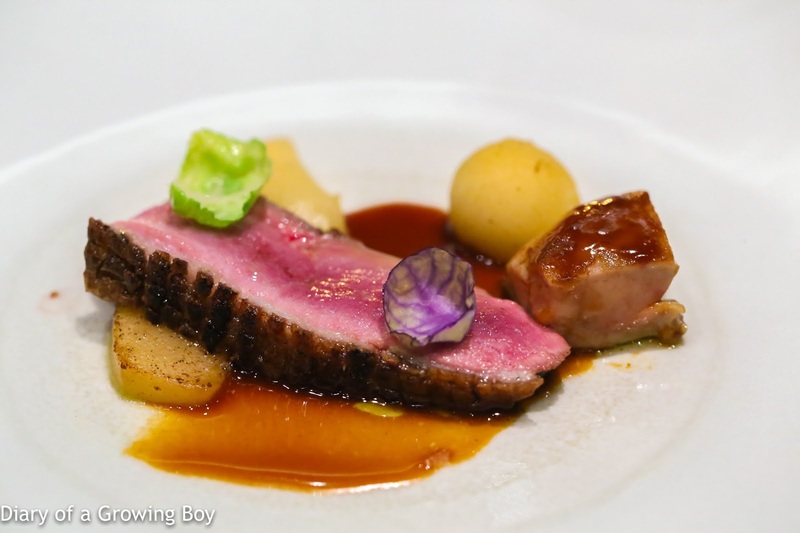 Challans duck, foie gras and spiced organic pear from 8½ Otto e Mezzo Bombana, Hong Kong - this piece of duck breast was just about perfect, with a layer of crispy skin and a rosé center. 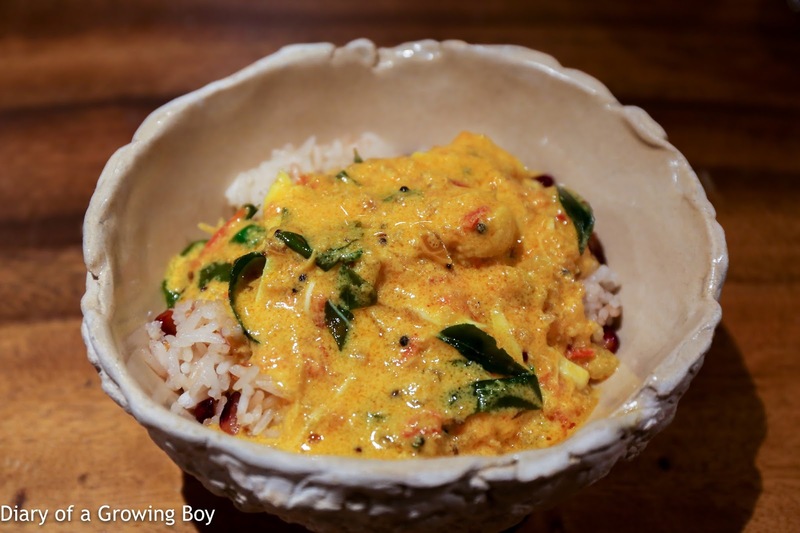 Mazegohan from Den x Gaggan, in Bangkok - simply one of the most delicious curry rice I have ever eaten - the combination of Hasegawa Zaiyu's corn rice with Gaggan Anand's crab curry with two different types of crab. 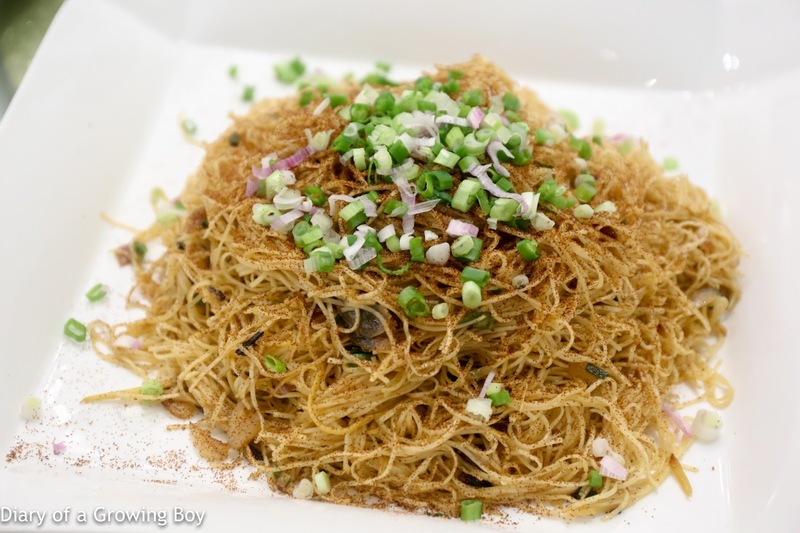 Crispy noodle with shrimp cramb and egg (หมื่กรอบจีนหลี สมัย) from Raan Tek Heng (ร้านเต็กเฮง), Bangkok - this was the best mee krob (หมี่กรอบ) I have ever tasted, with crunchy texture and tangy flavors. 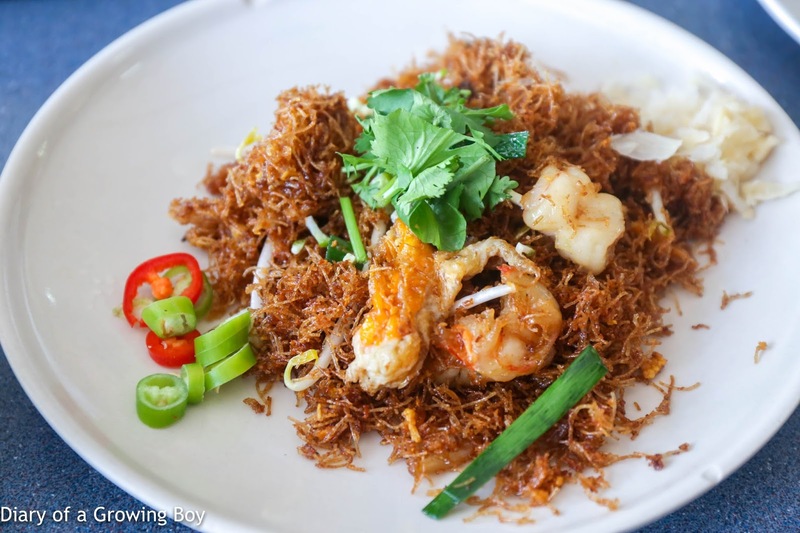 The recipe has been around for more than 100 years, and the dish was served to King Chulalongkorn himself. 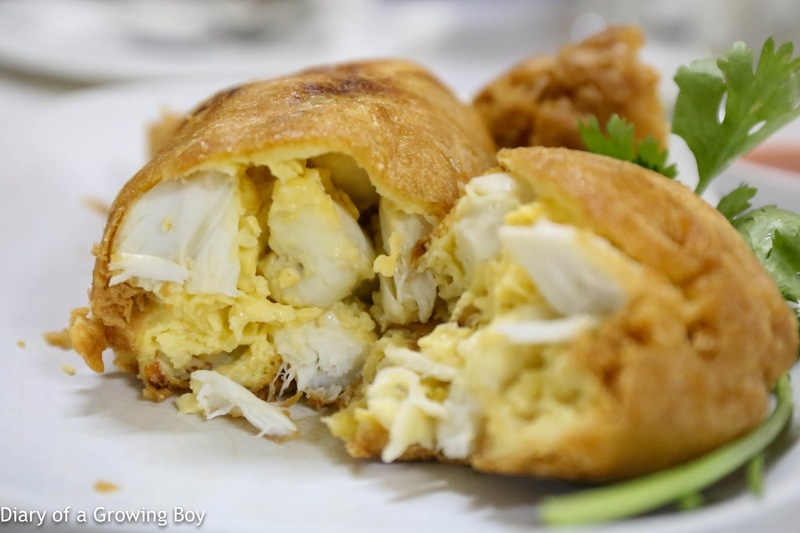 Crab meat omelet (ไข่เจียวปู) from Raan Jay Fai (ร้านเจ๊ไฟ), Bangkok - the famous crab omelet that I fell in love with last year, and thought was one of the best dishes I tasted in 2016. Now that Sister Mole has gotten herself a Michelin star, the lines for this delicious dish - priced at 10 times when other restaurants charge for their crab omelets - can now mean a 3-hour wait. 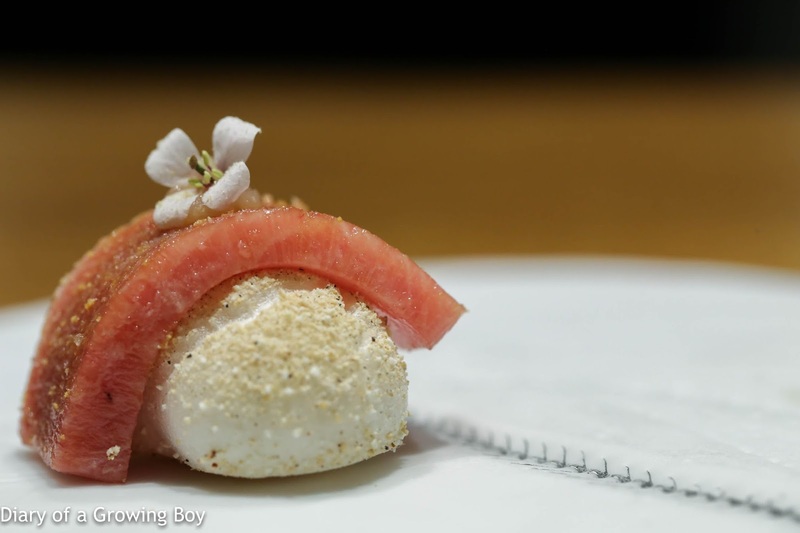 Chu toro from Gaggan, Bangkok - one of the most amazing bites I have ever eaten, and probably the most amazing texture from a piece of tuna. 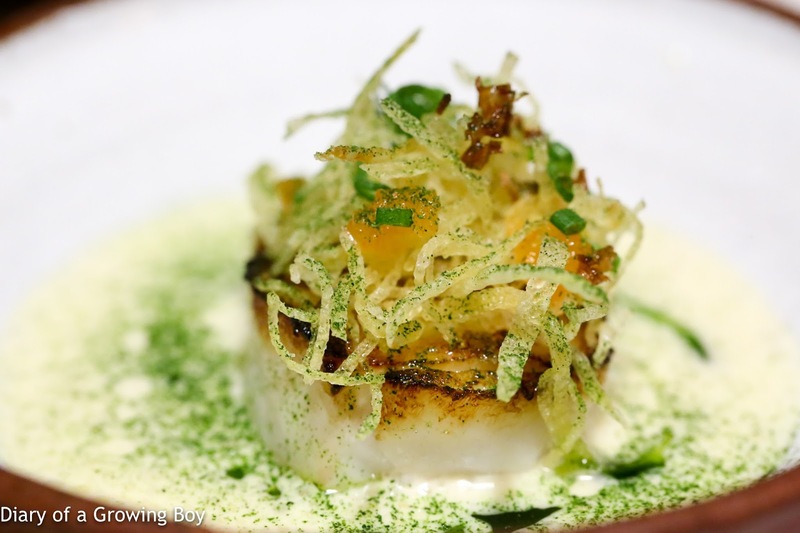 Scallop curry cold from Gaggan, Bangkok - another very emotional dish, where I simply couldn't believe that my eyes were deceiving me. What I was eating and what I thought was eating were two different things. 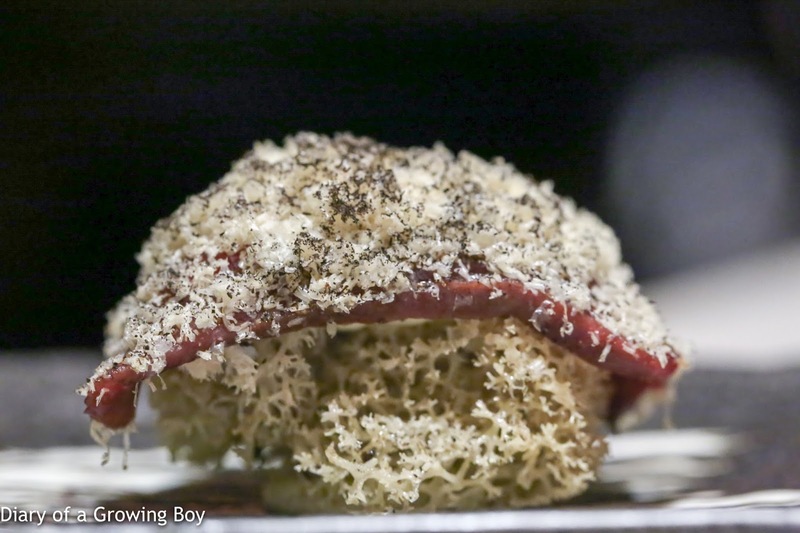 "Swedish sushi" from Frantzén's Kitchen, Hong Kong - I had never eaten reindeer moss before, and the piece of tender fallow deer on top - with a sprinkle of dried foie gras shavings and ash - just seemed revelatory. 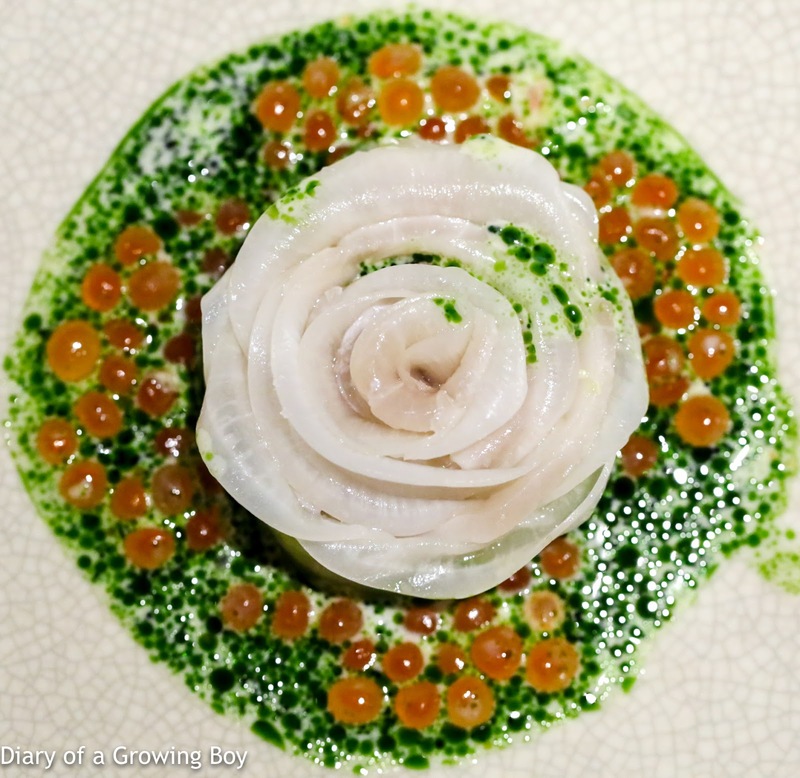 North Atlantic skrei "janssons" from Frantzén's Kitchen, Hong Kong - the dish seemed simple and straightforward at first, but for some reason it just ticked all the boxes... very tasty, comforting, and of course the presentation was very pretty. So good we ordered a second serving. 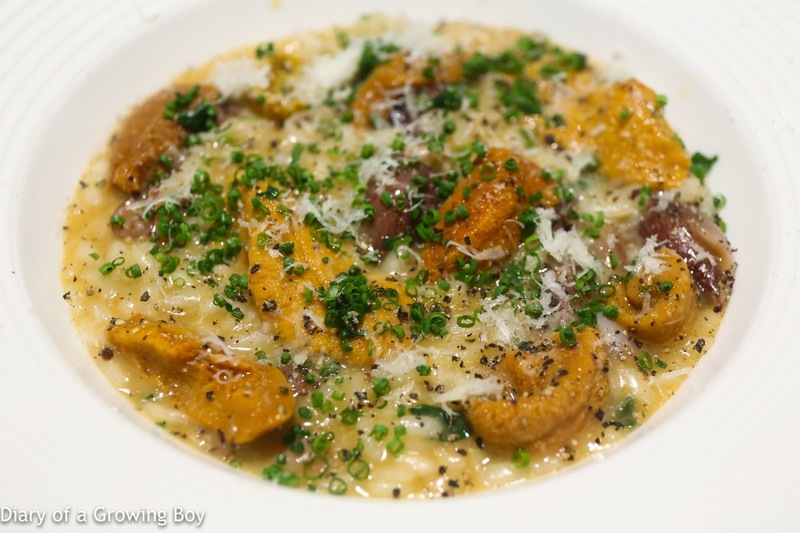 Toyama firefly squid / Hokkaido sea urchin risotto from Neighborhood, Hong Kong - firefly squids always make me happy, and putting them together with sea urchin in a risotto... just magnifies the flavors of a comforting dish. I could have a bowl of it all by myself. Maybe two. 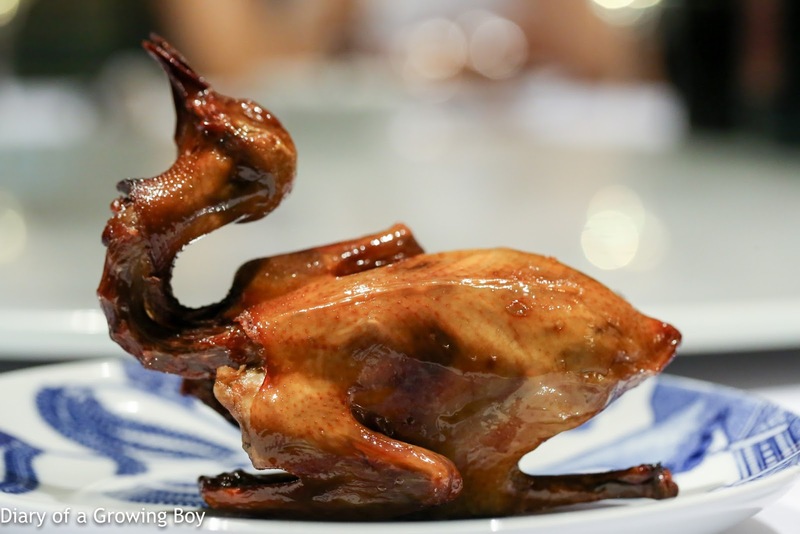 Crispy pigeon (脆皮燒乳鴿) from Stellar House (星月居), Hong Kong - this was hands down one of the best pigeons I have had in recent memory, and very likely the best Chinese-style pigeon. Incredibly crispy skin, coupled with an abundance of liquefied fat underneath the skin - which then imparted its flavors to the meat. I could just have 3 of these in one sitting. Slow cooked egg with onion and potato capuccino, Tasmanian truffle from Caprice, Hong Kong - I had this at the Tasting Room in Macau last year and it was one of my most memorable for 2016, and Guillaume Galliot brought the dish over to Caprice. Thankfully the portion size is smaller now. 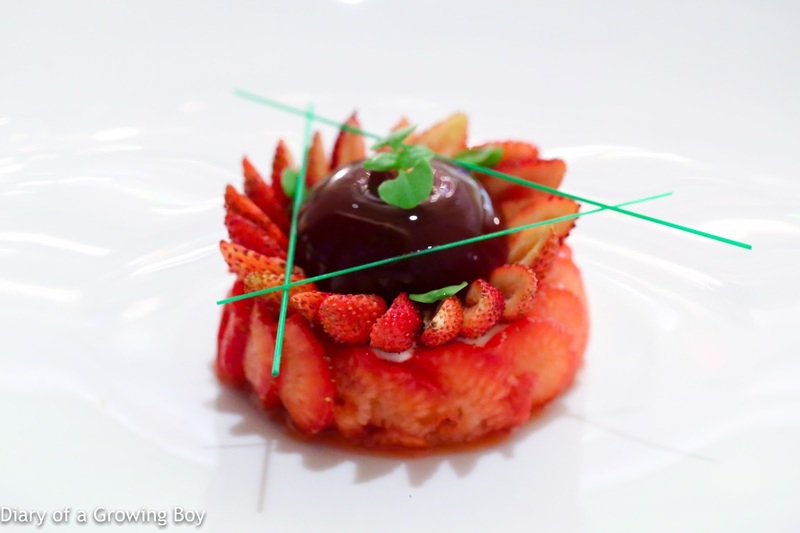 Fraisier Gariguette from Caprice, Hong Kong - Nicolas Lambert continues to weave his magic at Caprice, and this was an incredible creation with seasonal strawberries. "La vie en rose" buri from Gert de Mangeleer's pop-up at MUME, Taipei - the dish may have been centered around slices of raw yellowtail, but the ingredients around it packed a real wallop in terms of flavors. 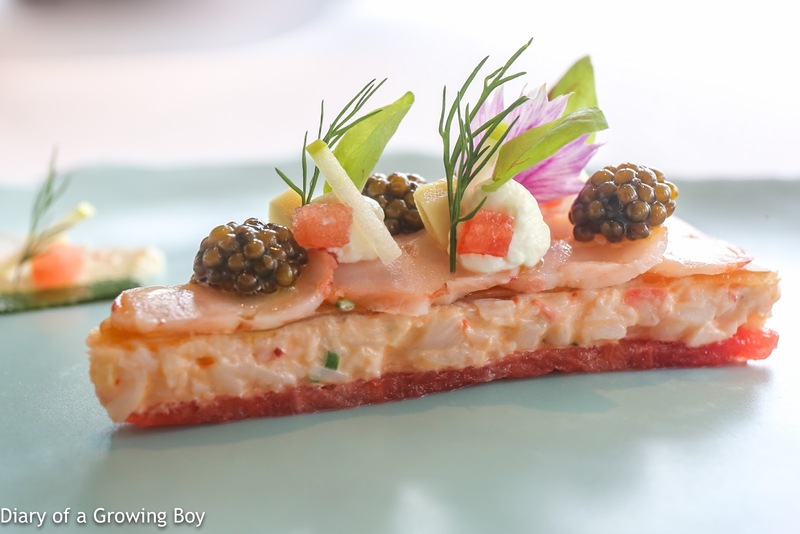 Poached Brittany lobster, watermelon and yuzu vinaigrette from the Tasting Room, Macau - a dish that Fabrice Vulin put together while at Caprice in Hong Kong, then refined it. A wonderful balance between umami and sweetness. 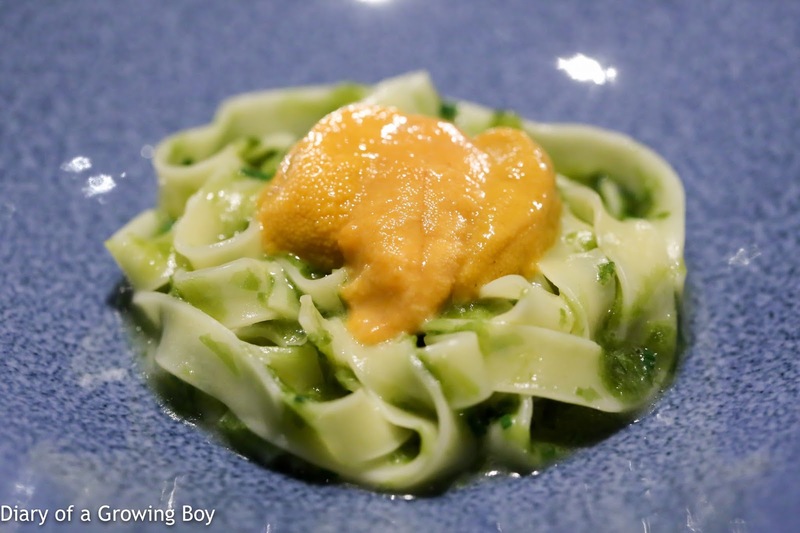 Prawn roe stirred noodle with prawn and shallot essence oil (蝦子蝦油蔥油撈麵) from Tasting Court (天一閣), Hong Kong - it's a simple dish that could be found in many, many restaurants in Hong Kong, but this one has them all beat. 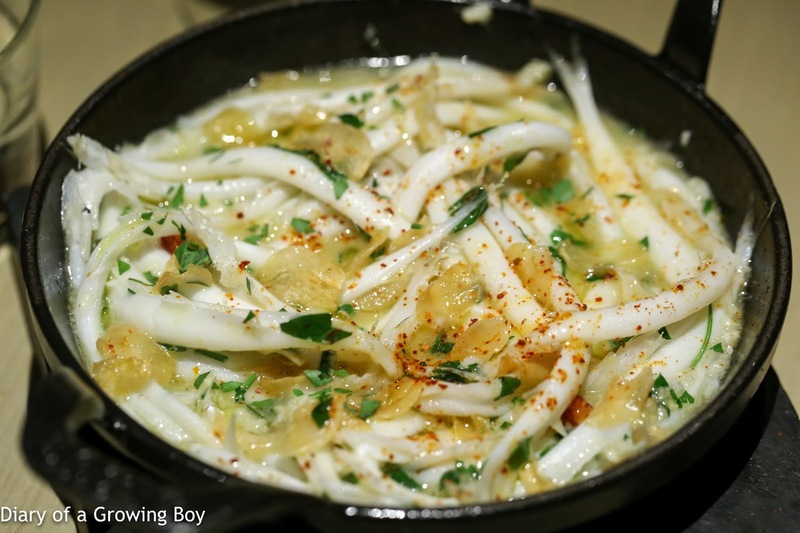 White baits "pil pil" baby eel style from Neighborhood, Hong Kong - such a simple dish with simple and inexpensive ingredients, but it delivered so much pleasure. 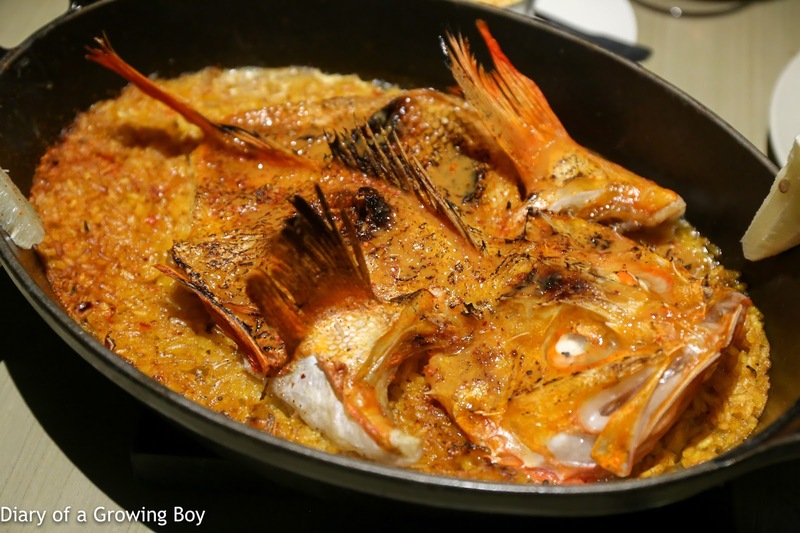 Kinki paella from Neighborhood, Hong Kong - putting a fatty and succulent fish like kinki on top of some rice. No brainer. 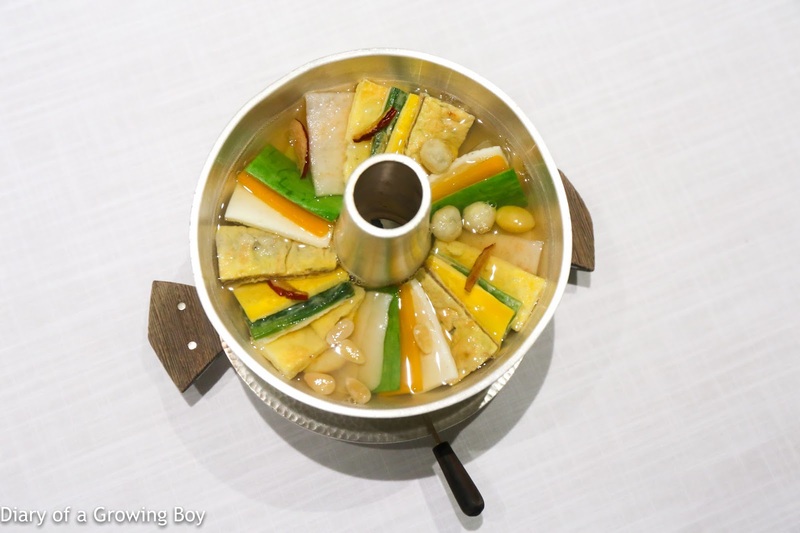 Royal hot pot (신선로) from La Yeon (羅宴), Seoul - an incredibly elegant and refined dish. 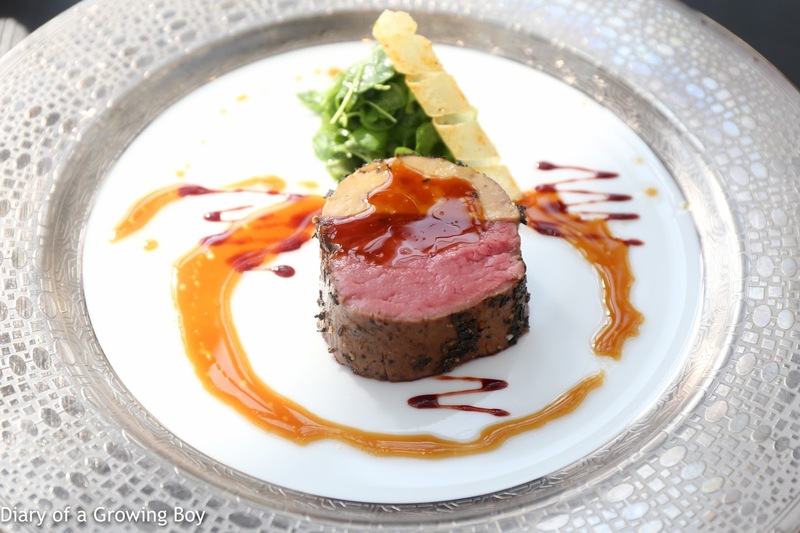 Meticulous preparation of each ingredient, delivering a wonderful balance of flavors. 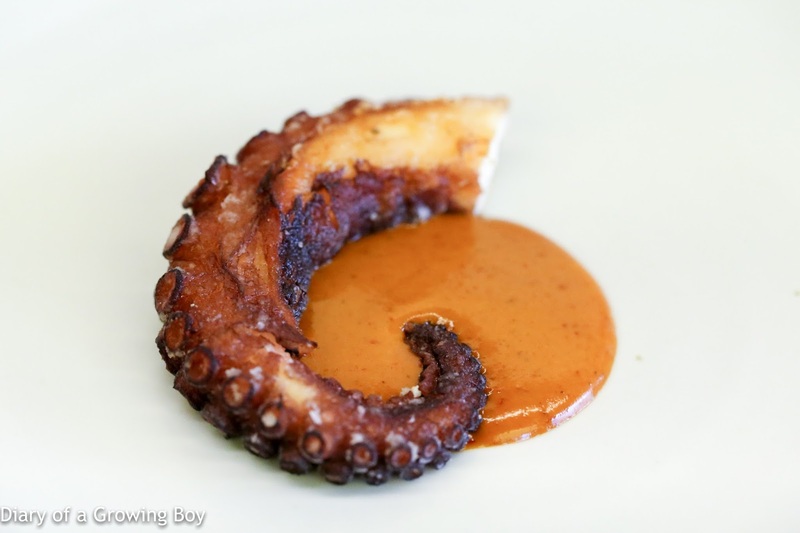 Octopus (문어) from Jungsik Dang (정식당), Seoul - WOW! An octopus tentacle that was crispy on the outside and incredibly soft and tender inside. With a spicy aioli full of umami. 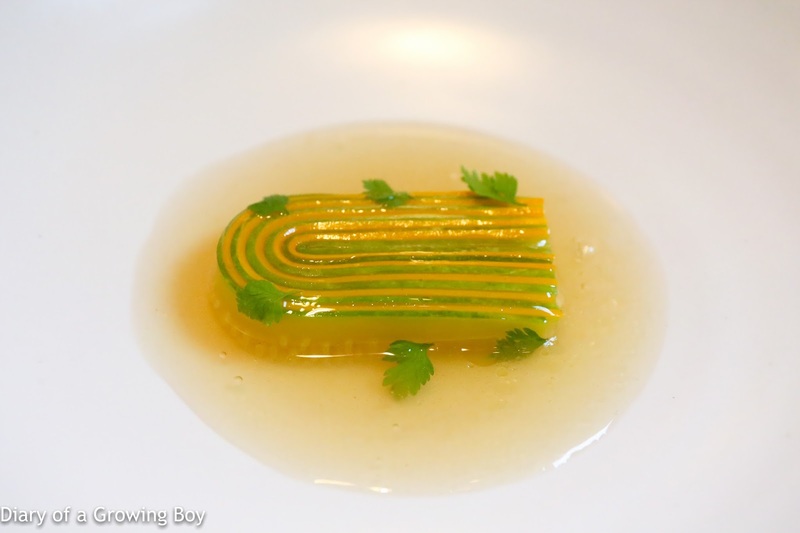 Summer zucchini : green and yellow zucchini, basil infused zucchini consomme from Mingles, Seoul - seemingly simple yet incredibly elegant and balanced. Purity of flavors. 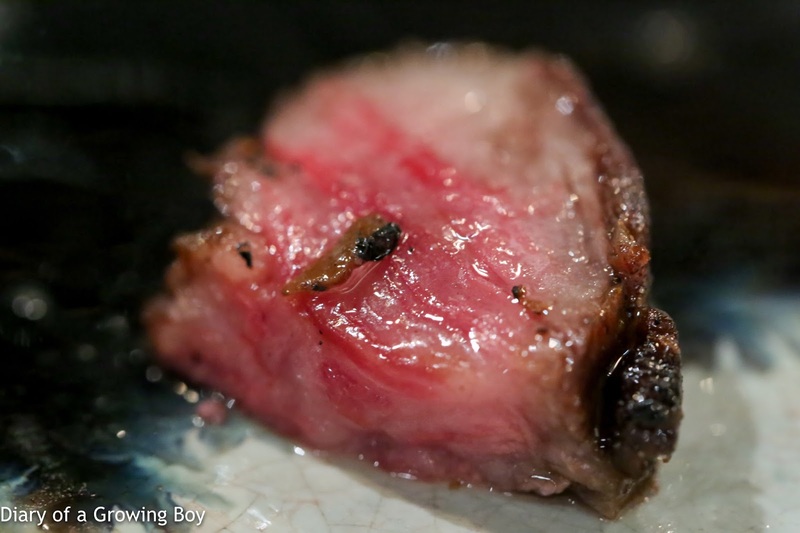 Uncut steak galbi from Born and Bred, Seoul - on a night with so many different cuts and preparations of Korean Hanwoo beef, this piece with crispy charring on the outside and incredible marbling inside took top honors. 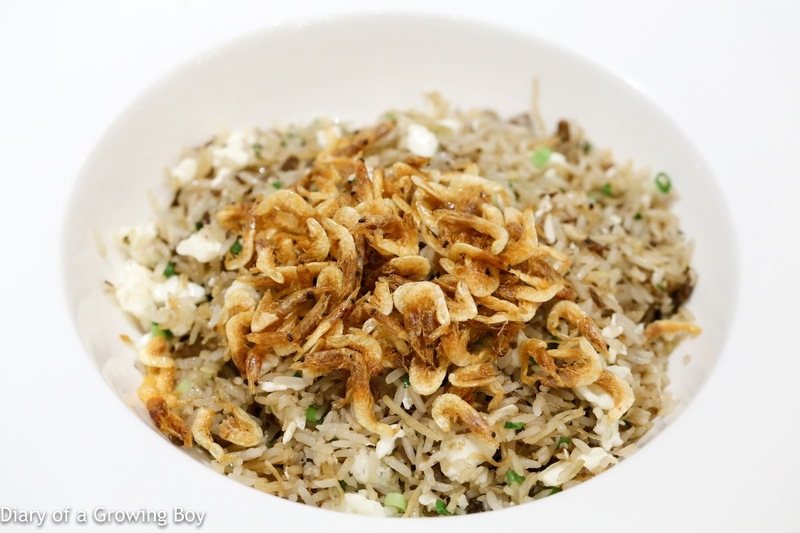 Fried rice with ginger, dried scallops, sakura shrimp and egg white (薑米瑤柱櫻花蝦蛋白炒飯) from Tasting Court (天一閣), Hong Kong - stir-fried at high heat to deliver dry, individual rice grains with bite... with crispy shrimp to boot. 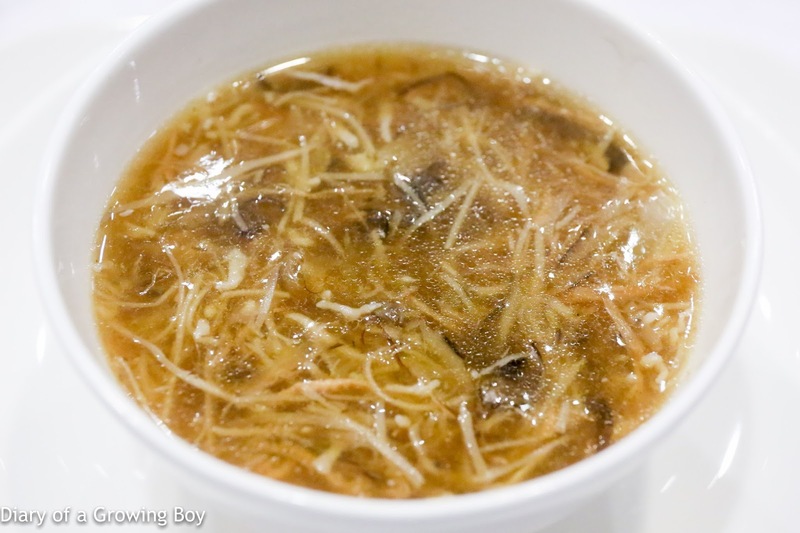 Imperial scholar's five-snake soup (太史五蛇羹) from my favorite private dining facility, Hong Kong - simply the best. I expect this to be on my "best of" list each and every year. 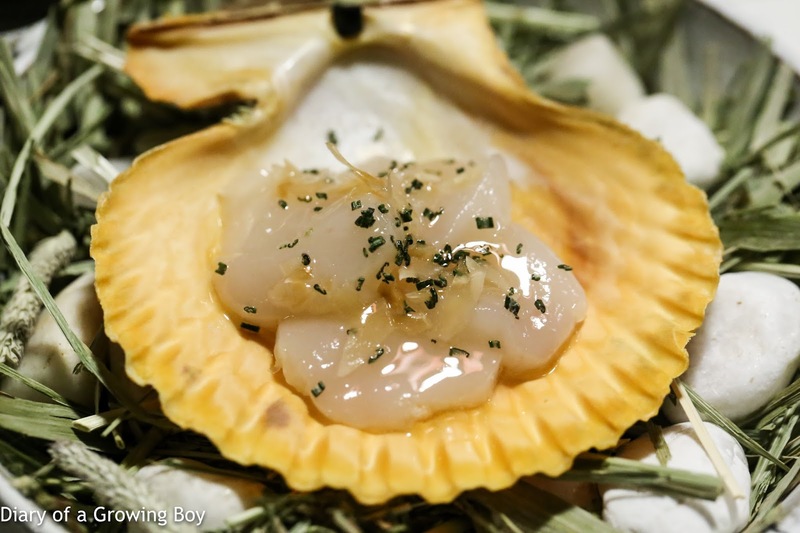 Noble scallop (桧扇貝) from Frantzén's Kitchen, Hong Kong - I don't recall ever eating a more tasty scallop than this one. 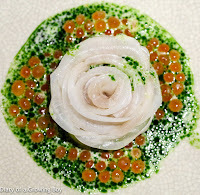 On top of the amazing texture, the flavor combinations were superb. Wild boar garganelli from Neighborhood, Hong Kong - simplicity is not simple. Getting the right balance among all the ingredients of a dish takes experience and skill. 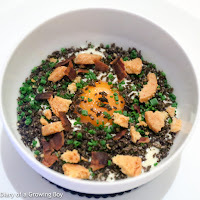 When a chef from a restaurant with Michelin stars sings praises for this dish, you know this ain't just a dish randomly thrown together. 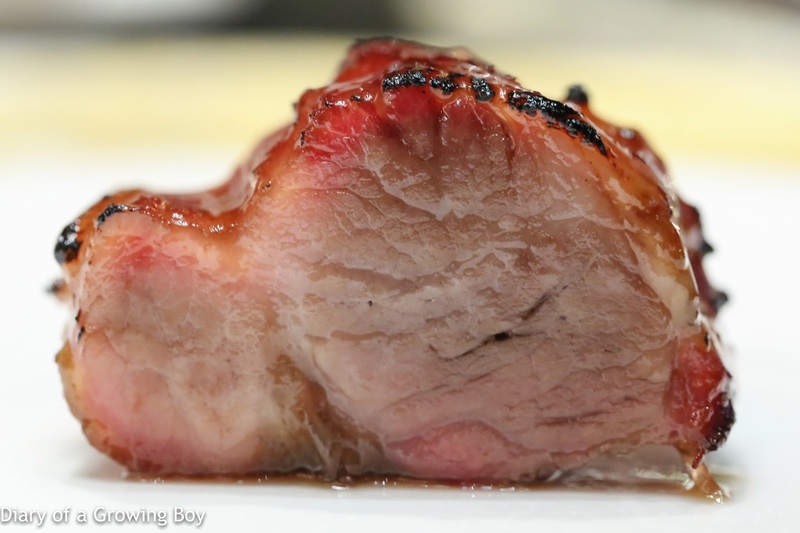 Barbecued pork (玫瑰蜜汁叉燒) from The 8 (8餐廳), Macau - so happy to have one of my favorite char siu again! Soooooo tender and delicious! 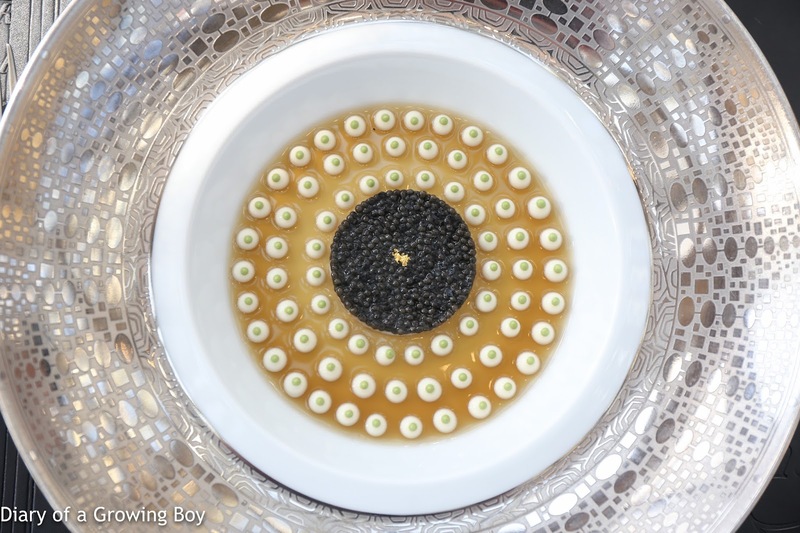 Le caviar: en surprise sur un king crabe rafraîchi d'une infusion de corail anisée from Robuchon au Dôme, Macau - one of the best dishes I had last year, and so thankful I was able to have it again this year. Classic from Oncle Joël. 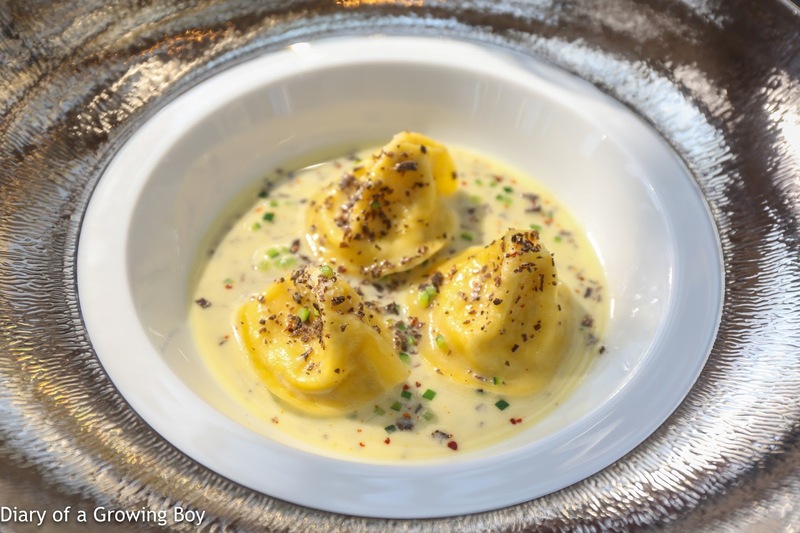 La truffle noire: en ravioles de Pecorino crémeux cuisiné au bouillon de poule from Robuchon au Dôme, Macau - as The Great One remarked, these ravioli stuffed with Pecorino and black truffle cream were simply "ethereal". Le bœuf: châteaubriand et foie gras en une interprétation "Rossini" au vieux Porto from Robuchon au Dôme, Macau - this has to be the very best tournedos Rossini I have ever had. The châteaubriand was incredible, as was the foie gras on top. Just watching it being sliced made me salivate. That comes to 32 dishes - one more than last year. A very good year. Here's hoping that 2018 will be just as good.